We create school design and architecture that facilitates learning, rather than dictating it. Today’s students don't absorb or retain knowledge the same way they did even a decade ago. The abundance of technology currently existing at their fingertips can't be overlooked, but it also shouldn't be the sole focal point of their learning environments. 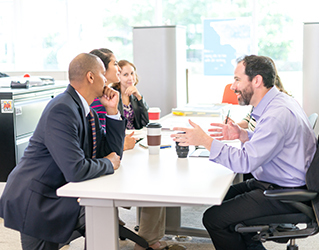 We know that teachers and school administrators are looking to school architects to design and build smart structures with an enduring life-cycle — to create a 21st century learning environment that adapts and evolves with the students. At Kirksey, we believe that good design comes from incorporating the needs of the students, their teachers, and school administrators. When designing schools, we take into consideration learning styles, environment, and pedagogy - all of which are fundamental to the design of each school and campus. Our design process is driven by six essential factors: Research, integrated design, performance, community, technology, and ergonomics. Passionate about education and research, our PreK-12 Team's goal is to design learning spaces for today’s students and tomorrow’s leaders. Through workshops and discovery dives, engaging students and staff, and leveraging our in-depth years of preK-12 architecture and design experience, we collaborate with schools to explore their vision for the classrooms of the future by delivering exceptional school facilities that are high-performing and sustainable by design. From sporting facilities and playgrounds to smart and sustainable school buildings, we are proud of the high performance schools we've designed. We are Kirksey PreK-12, and we're here to help you empower today's children and teachers through school architecture that adapts to changing technology and curriculum and ultimately shapes our communities. 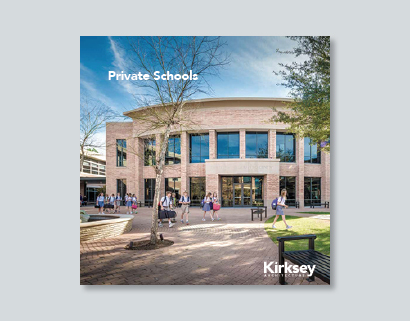 In collaboration with schools, Kirksey designs school facilities and classrooms that are adaptable, sustainable, and high-performing.